Kimberly-Clark Scott 2-Ply JRT Jr. Jumbo Roll Bath Tissue is perfect for high traffic areas and helps to reduce run-outs as well as consumption. 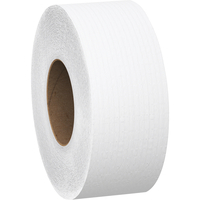 Bath tissue measuring 3-11/20 in x 1000 ft and is made from 20% post consumer materials. High capacity white tissue is reliable and practical choice.